A little over 2 years ago, two of my closest friends threw me a bridal shower, and included these AMAZINGLY delicious Lemon Cookies as favors for the guests. Omg, they were SO good. Words cannot describe. Well, ever since then, I’ve been hesitant to treat my self to these high calorie goodies, and I couldn’t find a Weight Watchers Lemon Cookies recipe that I liked. Needless to say, I’ve been dying for some lemon tea cookies!! So after playing around a bit with a few traditional lemon cookie recipes, I managed to create one that is decently lower in weight watchers points than the regular versions. Of course, I still wish they would be even lower in points so I could eat 100 or so, but alas, just a few will have to do. Enjoy! In a small bowl, combine flour, salt and baking powder; set aside. In a medium bowl, using an electric mixer, cream butter and sugar until light and fluffy; add egg yolks and combine thoroughly. Add lemon juice and zest; beat well. Add yogurt and a small amount of flour mixture (about 2 tbsp); beat to combine. Add rest of flour mixture and mix thoroughly. Turn dough out onto a large piece of plastic wrap. Cover tightly and refrigerate for 2 hours and up to 24 hours. Preheat oven to 375ºF. Coat 2 cookie sheets with nonstick spray. Use large tablespoons of dough and roll int 30 balls; place about 2-inches apart on prepared cookie sheets. Bake until edges of cookies turn golden, about 9 to 12 minutes. Remove and cool slightly. Put powdered sugar into a food storage bag; shake still-warm cookies, a few at a time, to coat lightly. i would like the breakdown so we could calculate thenew points, do you have it? what are the points plus values? I made these last night—delicious! My only problem will be sticking to only eating 2! Thanks for sharing—-by the way, is that 3 of the old points or 3 on the new points+ ? Currently, I have the old points posted for this recipe, not the new points plus. What would the point value be if you used Splenda instead of 1 cup of regular sugar? Would that work or does real sugar work better? I think it would take about 1 Point off the serving. In my opinion, I'd stick with the regular sugar. It will taste much better and the Point value isn't affected greatly enough to make it worth it. 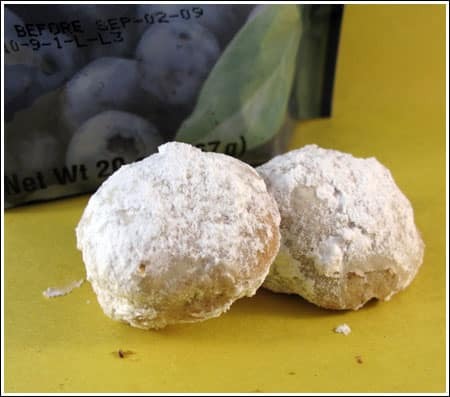 In the Lemon Tea Cookies you don't have the amount of sour cream in the ingredients list, however, it is listed in the directions to add to a small amount of flour mixture. How much sour cream should there be in the recipe? Thank you. Ooo, geez, thanks for catching my mistake!! The directions should read yogurt instead of sour cream. As for the flour, start by adding in about 2 tbsp, then add in the remaining amount. Enjoy!